“a piece of space APS,” which opened in November 2004, is a small art space of only 10 square meters, completely renovated in white. The two people who run the space have worked in the field of contemporary art for many years. It holds contemporary art exhibitions, and is also used as an art project office. Therefore, APS is not only an art gallery, but an art project space, in which the organizers investigate into and propose what we think is necessary in society today. We aim to accomplish this by holdings exhibitions and executing projects within the field of contemporary art. A series of solo-exhibitions held irregularly at APS, entitled “a piece of work,” asks the selected artist to bring the space to life with just one work. 1. Tokyo Metro Ginza Line: Get off at Kyobashi Station (G 10). 2. Go up the stairs of Exit 2. 3. Walk straight on the Chuo-dori toward Ginza until you come to the corner of the cake shop Cozy Corner (2 min. ), and turn left. 4. Then, walk 2 short blocks and turn right at the corner. 5. 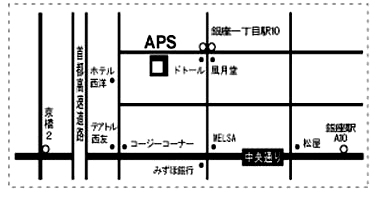 APS is in the building next to the red signboard on which is written “Office DEPOT.” 5th floor, room 511. Open: Wed., Thu., Fri. and Sat. Closed: Sun., Mon. and Tue. Please check with the gallery for exhibition schedules. We only hold 3 to 5 exhibitions per year.